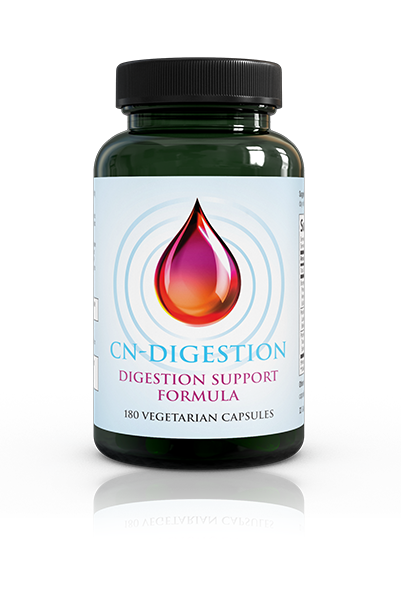 CN-Digestion places special emphasis on proteolytic enzymes so that it can be used for both digestive support and help provide building blocks for injured tissues. It is a comprehensive digestive enzyme and probiotic blend specifically designed to aid and support digestive tract function and nutrient absorption. Key ingredients are therapeutic doses of Lipase (fat digestions), Protease (incl. Bromelain, pepsin, trypsin, and papain), Lactase (lactose digestion), Amylase (carbohydrate breakdown), Cellulase (fiber digestion), Dulse, Spirulina (super blue-green algae), and Invertase (splits sucrose into glucose and fructose over a broad pH range).